The Flash (1987) Average 0.00/5 - out of 0 total votes. The second volume of the series is a long-running hit in its own right. 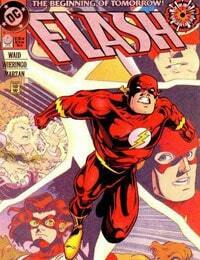 This volume follows the adventures of Wally West in Keystone City. Wally, having picked up the mantle of the Flash after the passing of his mentor Barry Allen, has made startling discoveries about the nature of his powers and the history of the fastest men alive. Recently Wally was granted the wish to have everyone in the world forget his secret identity in hopes it would keep his wife Linda safe from his enemies.